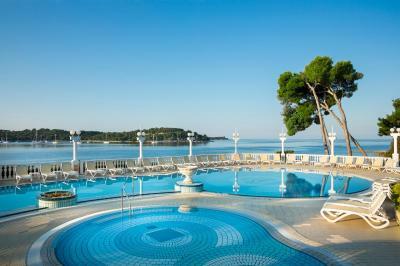 Lock in a great price for Island Hotel Katarina – rated 8.6 by recent guests! Our room had a fabulous view of the town and a nice balcony to sit on. We had one of the renovated rooms, which was small but fine for our needs. 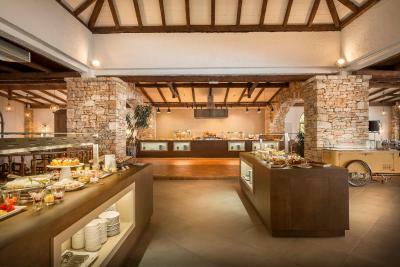 The included breakfast buffet was great, lots of options. My mom really enjoyed walked around the property. We came to town in a rental car, I had some issues finding where/how to park but the shuttle staff were great. Never have ever booked a super hotel valued themself as three star hotel! We were uncertain whether we would like to be on an island, but we found we loved it. 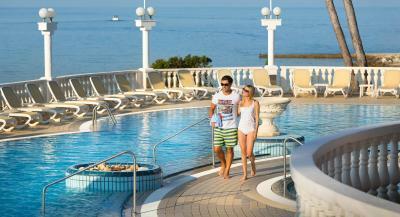 If you are in vacation mode and are willing to time your visits to the mainland, it's a fabulous place to stay. It was romantic and relaxing. We loved having the beautiful view from our balcony of the Old City across the water. 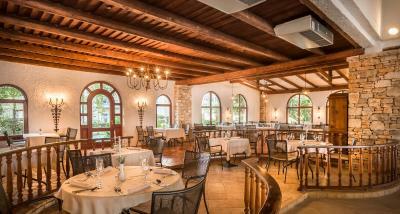 The room was clean and comfortable, and breakfast was outstanding, with more choices than we could imagine. We definitely recommend this hotel. The location is incredible. Worth the visit just to be on the island. Our room (superior room) was quite big. Wifi is fine. 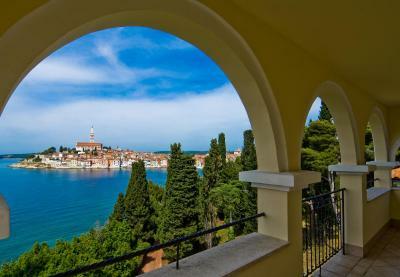 The island is beautiful and views of Rovinj are stunning. Breakfast buffet was very good with many choices. View from our balcony was incredible! 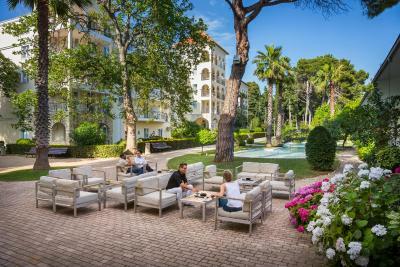 Island Hotel Katarina This rating is a reflection of how the property compares to the industry standard when it comes to price, facilities and services available. It's based on a self-evaluation by the property. Use this rating to help choose your stay! 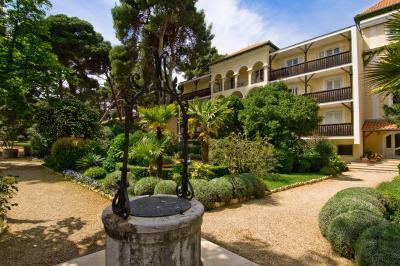 One of our top picks in Rovinj.Hotel Katarina is situated on a wonderful island across from the historic center of Rovinj. 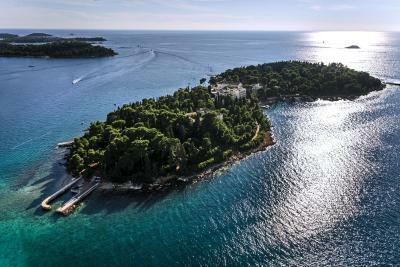 The island, sharing its name with the hotel, is the second largest island within the Rovinj Archipelago. 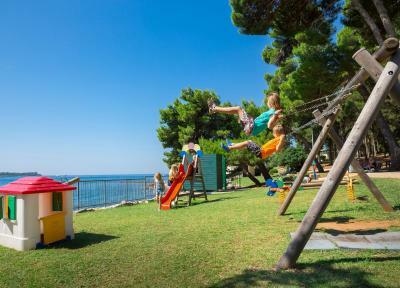 It features abundant Mediterranean vegetation, promenades and 19th-century parks boasting magnificent views of the town, of the Zlatni Rt forest and the rest of the Rovinj Archipelago. 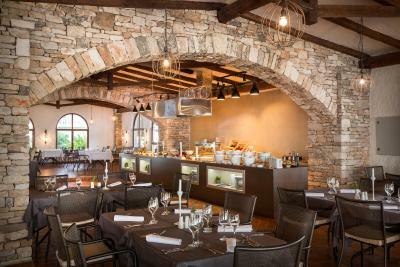 It is also distinctive,as the remains of an old castle were integrated into the hotel building, giving it a touch of the Austro-Hungarian Empire. 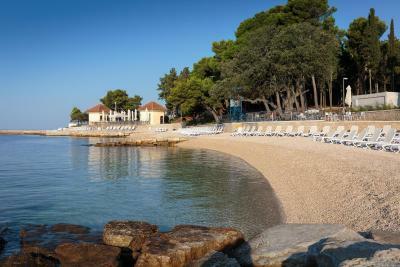 When would you like to stay at Island Hotel Katarina? This room features a balcony and satellite TV. Please note that 2 adults and 2 children up to 11 years old can be accommodated in this room. 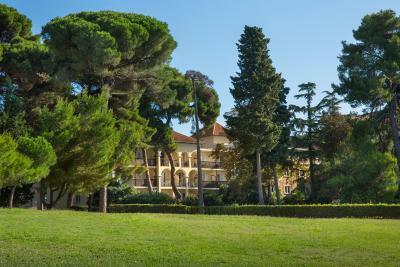 Situated on a beautiful island, a stone throw from the Rovinj city centre, Hotel Katarina is a romantic getaway surrounded by a lush 19th century garden that offers perfect vistas of the old town and Punta Corrente Park forest. 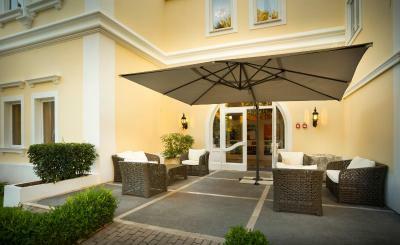 House Rules Island Hotel Katarina takes special requests – add in the next step! Island Hotel Katarina accepts these cards and reserves the right to temporarily hold an amount prior to arrival. Room upgrade upon request at reception. There was a ornamental pool just in front of our room that mosquitoes were attracted to so we didn’t sit outside on terrace. We were bitten in our room if we left door to terrace open. Most of the staff were lovely and helpful but chap doing eggs at breakfast was very miserable. Perhaps it is normal for him. Tried smiling at him but no response. When we arrived at Marina we were sure that our car wasn’t left there but we had to follow minibus to a parking area quite a walk from Marina. The bus brought us back but we decided not to use car when we were there as we didn’t think we would be able to walk that far. My sister and I are both pensioners. From description we believed car would be at Marina. The island location was very peaceful but it was end of season and not too many guests. Breakfast was good but they did run out of breakfast tea. Luckily we had some of our own. The ferry was on time whenever we went across to Rovinj and staff very helpful. We asked if we could keep our room on day of departure as we had late flight and were able to. Perhaps as Hotel was closing next day. 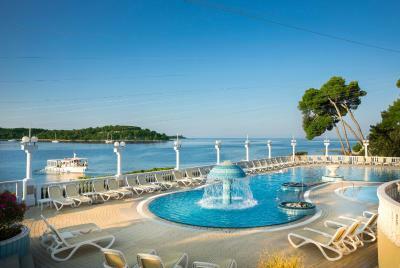 We found out on our last day that you could get ferries to visit other islands in the same hotel group for a small fee. Would have been good to know at the hotel. There was nothing of concern. The arrangement for parking the car and then getting the ferry shuttle to the hotel worked seamlessly. When we requested a change in the room to secure a balcony and a view it was attended to without fuss and it was provided at no extra cost despite the fact that we were essentially asking for an upgrade. The breakfast/dining area was quite large and the number of people present made it quite noisy but there was wide choice at very reasonable prices. 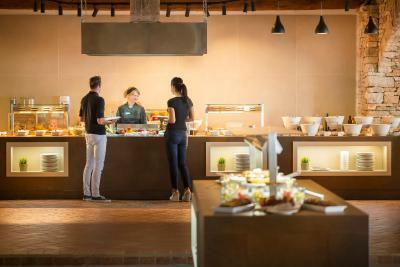 Generally the staff in the eating area was friendly although some were a little brusque at times, probably after a summer of tourist demands. 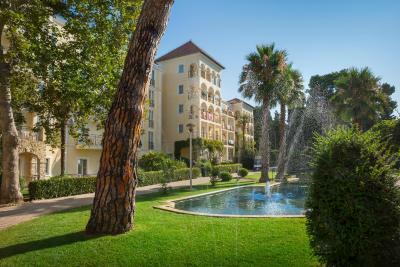 The grounds of the hotel were very pleasant for a stroll. Ferry access to and from Rovinj itself was excellent. Everything was incredible. They are kind. The view is breathtaking. 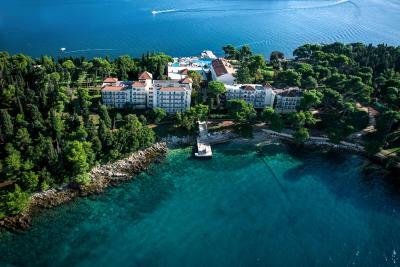 This hotel and the island was my highlight for the entire trip in Croatia. The hotel restaurant was sooooo good. Taste was great and the cost was very reasonable. Beautiful and wonderful hotel. Kartarina!!! Arriving you feel like a queen but the magic, frankly, soon wears off: this place - from the lobby to the rooms to the mini golf station - is in need of some serious renovation. It was fun to spend two nights there at a very competitive rate at the end of the season (69 EUR a night w/bkfast) but if I came during high season and had to spend a serious amount I would NOT have been happy. This place could be fantastic if in the right hands - it's a 5 star location - but it needs some help. Walls very thin, we were awoken several times by people talking loudly next door and checking out early. A big wedding taking place there also kept us up as did the boat bringing the celebrating folks home all through the night. Once was enough, frankly. 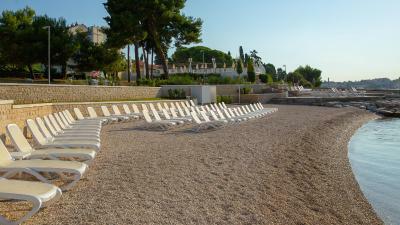 Fabulous location, an exciting feeling to be on an island yet so close to the beautiful little town of Rovinj. 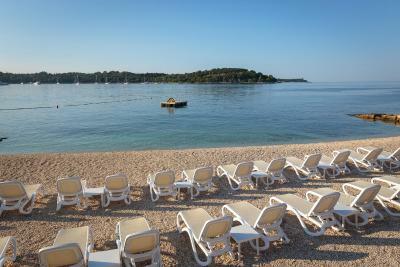 Excellent boat transfer every hour, wonderful sun bathing spots all over the island. Large variety at breakfast. Staff very professional. The excellent hourly boat service runs into the small hours, and it was possible to hear the boat engine with our balcony door closed. We heard the sound on night one, not on night two, but again on night three. There are two jetties, and we suspect they alternate the night time usage, to provide an every other night noise break. Since the Hotel is on an Island the staff are even more important than usual. A minibus from staffed free parking to a jetty, onward transport on the hotel's boat, staff collecting cases at the Island jetty. All were excellent as were the actual Hotel staff themselves. 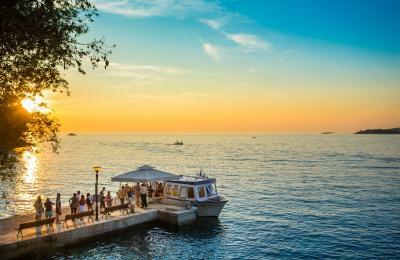 The boat travels to Old Rovinj town, and also to another jetty from where staff provide transport to and from the free car park. Very good buffet breakfast and buffet dinner too. 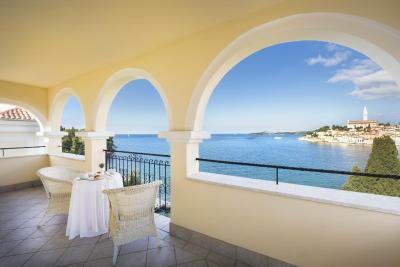 We had a nice room with a partial balcony view of the lovely town of Rovinj. 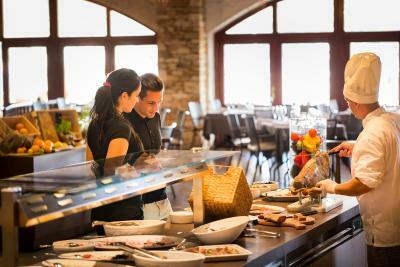 Great location, stuff is excellent, breakfast is reach and diverse, I liked the local twist to it. There is no hot tub and the wedding party was loud till 4 am but it didn’t wake my wife so maybe I’m just sensitive that way. Wonderful breakfast and dinner. It’s buffet style but a great variety and presented very well-tasted great too. The staff is wonderful and hard working to make it a great visit. The views and water are the best. I travel a bunch and would recommend this to families especially. The restaurant doesn’t know how to cook pasta, and there were many mosquitoes. The hotel has a great view of the city and a nice pool. The price is more than fair. The klapa could be better, but that would be only a bonus! Some paths around the island are a bit slippery. Everything; great views and service. 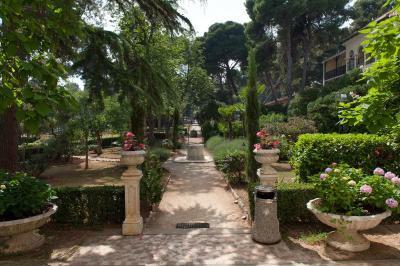 The grounds were stunning with so many different places to walk and sit. The first photo is a view from our room, which had a large balcony. Food was excellent and good value. The view was amazing. Close to town. Overall old property, needs refurbishing, that part is not really great value for money. 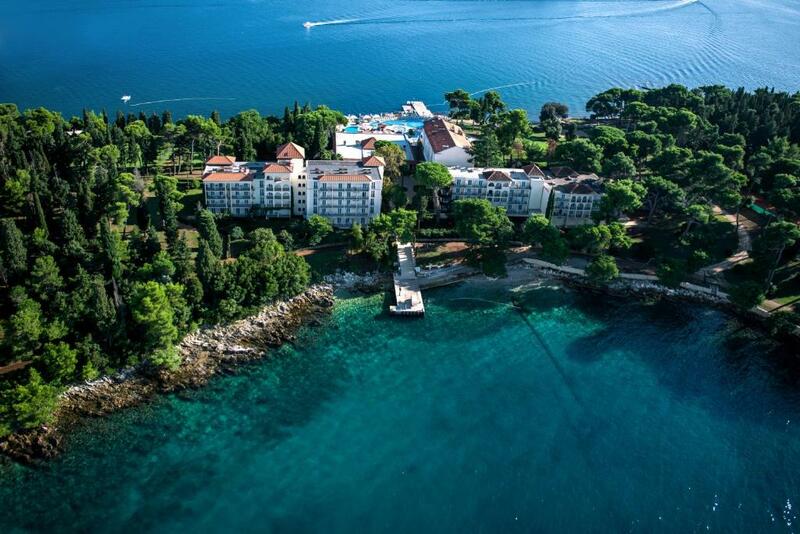 Stunning location and views: beautiful private island. Beaches. Great boat connections to Rovinj. Staff is very professional and pleasant.